Old North State Politics: As We Entering NC's "Blue-Moon" Mid-term Election, What Are The Trends In Registered Voter Turnout Come November? As We Entering NC's "Blue-Moon" Mid-term Election, What Are The Trends In Registered Voter Turnout Come November? With attention now turning to November's mid-term election, questions are being raised about voter turnout in the first "referendum" of the Trump Republican government. And while North Carolina won't have a major state-wide race (such as a U.S. Senate or gubernatorial contest) on its fall ballot, the prospects for Republicans holding their current 10-3 congressional advantage and their super-majorities within the general assembly are already surfacing. In general, mid-term elections are considered "referendums" on the party in power, especially the party that controls the White House. With Republicans controlling the White House and both chambers of Congress (a nominal majority in the U.S. Senate, however, but lacking absolute control of the upper chamber due to the 60 vote cloture rule), the focus through 2018 will be on the GOP and whether voters seek to continue unified party government, or whether the "checks and balances" will come with Democrats claiming one, or perhaps both, congressional chambers. The fight for Democrats will be hard in both chambers, due to the U.S. House's tilt to the Republicans (through the power of partisan gerrymandering in a number of states; see UVA's Center for Politics' analysis on how Democrats will have to compete in various states to build towards 218) and the U.S. Senate's tilt towards heavy Republican states with Democratic incumbents in this year's class (see Charlie Cook's breakdown of seats and their likely leanings). Much of mid-term elections come to energy levels among voters, especially those likely to cast a ballot in an off-presidential year. Turnout rates decline considerably in mid-term elections from presidential contests; for example, in North Carolina, while the average registered voter turnout in the past four presidential contests (2004-2016) was 68 percent, the past three mid-term elections saw an average registered voter turnout of just 42 percent (in 2006, it was 37 percent, to 2014, a high of 44 percent). 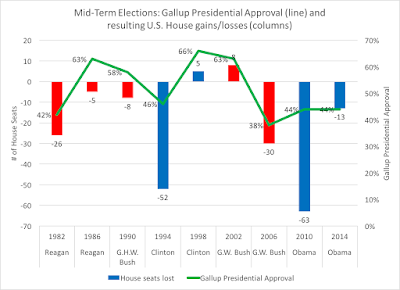 Another "fundamental" that political scientists look at in assessing the trends of mid-term elections is the fact that voters tend to use mid-term elections as a "check" or referendum on the party controlling the White House. 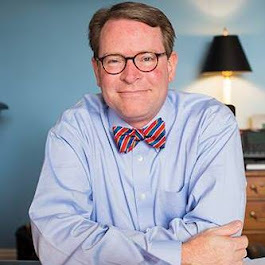 For example, in Obama's first mid-term election of 2010, the Democratic White House was clobbered by the Tea Party insurgency that lead to Republican control of the U.S. House, and particularly at the state-level, helping Republicans secure (for example, in N.C.) the state legislature in a critical redistricting year. With Donald Trump's approval numbers in a 35-40 percent range (a historic low trend for a first-year president), the GOP will find itself with some strong headwinds going into this year's election season. 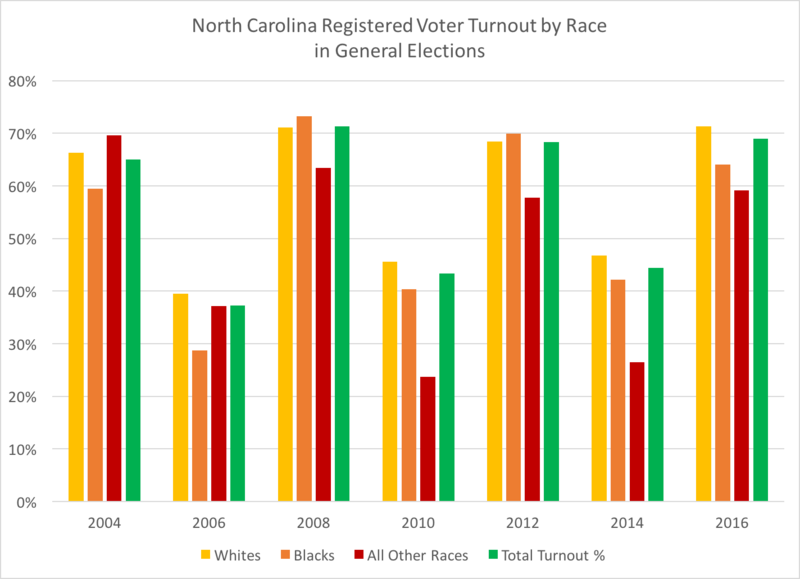 In exploring who will show up come November, one can detect trends in registered voter turnout through data from the North Carolina Board of Elections, especially when it comes to party affiliations (or lack thereof) and by race. The "mountains" of presidential election year turnout rates compared to the "valleys" of mid-term election years are quite distinguishable, with the following trends: in mid-terms, registered Republican turnout generally is higher (average of 47 percent for 2006, 2010, and 2014 general elections) compared to registered Democratic turnout (average of 44 percent), while registered unaffiliated voters have the lowest turnout (average of 31 percent over the three most recent mid-terms). Again, the presidential "peaks" and mid-term "valleys" are clear, but so too are the differences among racial groups in North Carolina. With black voters holding an 81 percent Democratic registration percentage, this reliable voting bloc is a critical component to Democrat's success in elections; while Republicans make up a plurality (41 percent) among white voters, with a third as registered unaffiliated, the higher turnout levels in mid-terms among white voters has helped Republican efforts. On average, white registered voters have a 44 percent turnout rate, while black registered voters have a 37 percent average turnout, and all other races are at 29 percent in mid-term general election years (2006, 2010, and 2014). If 2017's contests, such as Virginia's House of Delegates contests and Alabama's US Senate special election, are any indication, it will be important to watch the turnout rates of some key groups, especially black/African-American voters and other Democratic registered voters. The wild card, as usual: what will registered unaffiliated voters do? 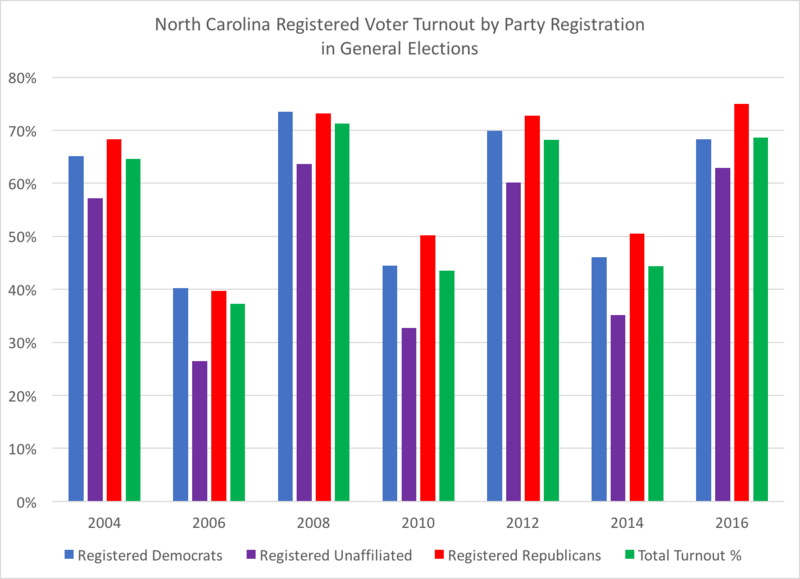 Research shows that unaffiliated voters tend to lean to one party over the other and thus are as partisan in their voting behavior, but with NC's unaffiliated voter pool now second in terms of numbers (surpassing registered Republicans in 2017), their turnout rate will be important to watch in 2018.